Pinkbike visited the SRAM pits at Crankworx, where local legend Shawn Cruickshanks was working his way through a line of suspension forks tagged with the names of many top competitors, as well as the lucky ones who stood in line to receive Pro RockShox service during the week-long festival. 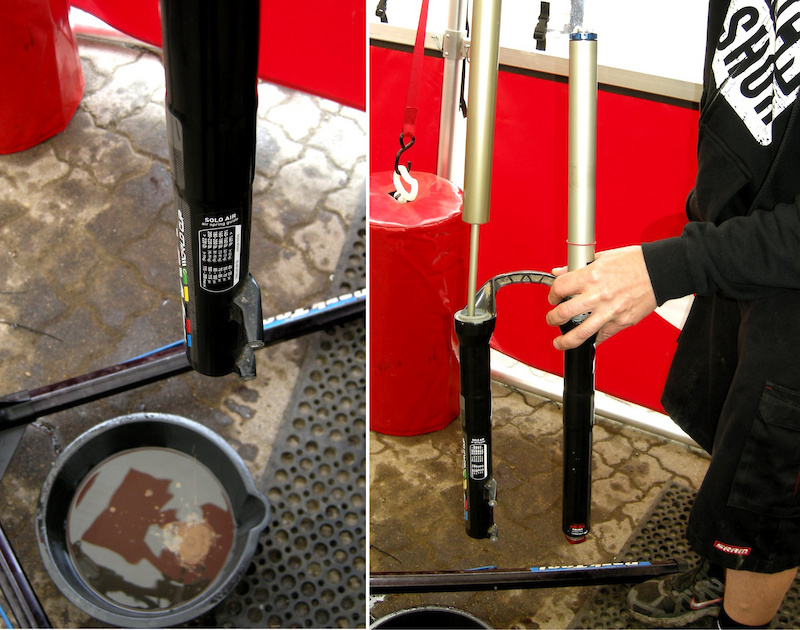 Shawn made time to run Pinkbike through the process of replacing the seals and dust wipers of the very popular 2011 RockShox World Cup fork. Watch and learn. 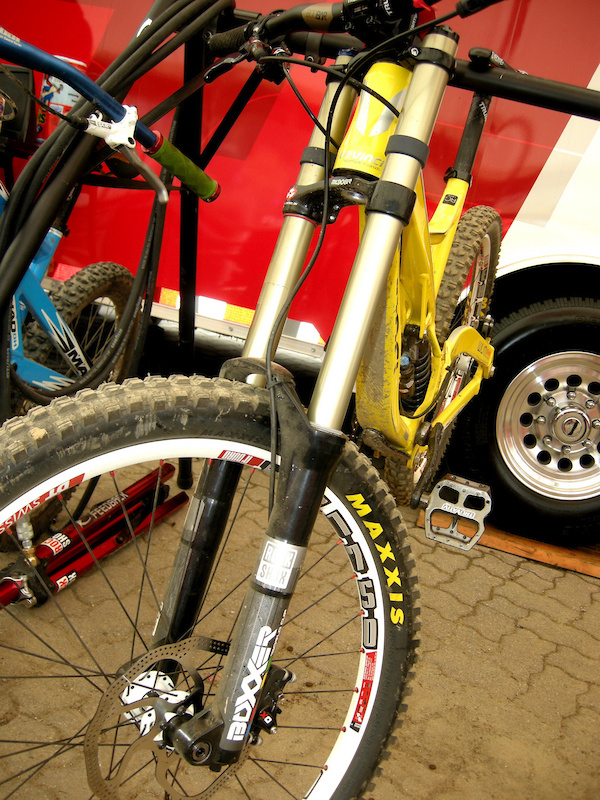 The 2011 air-sprung RockShox World Cup fork is fork of choice for downhillers who are both weight and performance minded. This one needs some love and attention. -SRAM seal driver for 35mm forks or a large, clean socket wrench that matches the diameter of the seals. -Sturdy wire, looped on one end to hold shop towel for cleaning inside of fork sliders. 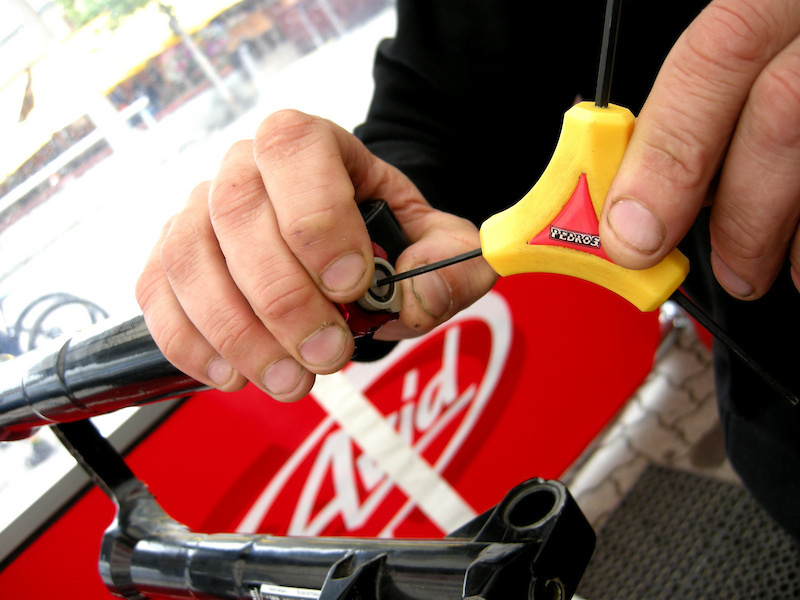 While you can change the fork seals and wipers while the fork is on your bike, the easiest way is to remove the fork stanchions from the triple-clamps and then use a bike stand to hold the fork while you do the work. Jot down your high and low-speed rebound settings before you get started so you can return the dials to their proper place after the rebuild. 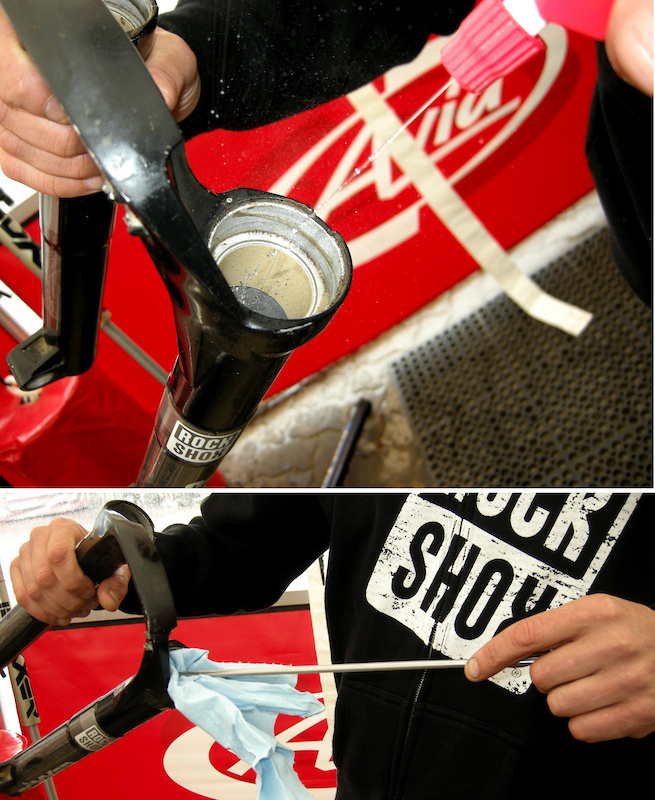 As with all suspension work, take the time to clean the external fork parts to ensure that your results are actually improving the fork’s performance, not sentencing it to death. Step two: Pump the slider a few times to get as much suspension fluid from the fork leg as possible (there’s only 10 CCs inside, but it will look like a lot more on your Persian Carpet). Slide the stanchion tube out of the slider and put it somewhere where it will stay clean. Step three: Clamp the damper-side stanchion in the work-stand and then hold the rebound dial on the bottom of the right slider with one hand and use a 2-millimeter Allen key to remove the retainer screw. Slide off the low and high-speed rebound dials to expose the 24-millimeter wrench flats on the rebound adjustment body. Don’t lose the black washer that separates the two dials or you will be sad later. Step four: Use either a 24-millimeter open end wrench, or a RockShox approved BFC (Big Fernie Crescent wrench) to unscrew the aluminum rebound adjustment body half-way out and then give it a sharp tap with your plastic hammer to release the damper shaft. Remove the adjustment body and then pump out the suspension fluid, remove the slider and store the stanchion tube as in step two. Step five: Make a visual inspection of the inside of the slider tubes. Look for gouges, scoring or excess wear in the upper and lower bushings, as well as dirt or metal chips that may be polluting the fork’s internals. Next, give the stanchion tubes a look for scratches or dings that could cut the new seals. If your fingers can feel any significant scratch, your stanchion tube may be a candidate for replacement, as the scratch will eat through the seals quickly. Step six: Shawn uses a Pedros tire lever to remove the seals because its smooth, flat, working end will not damage the thin walls of the slider tubes. There are two seals in the World Cup slider, the gray dust wiper and the black oil seal. 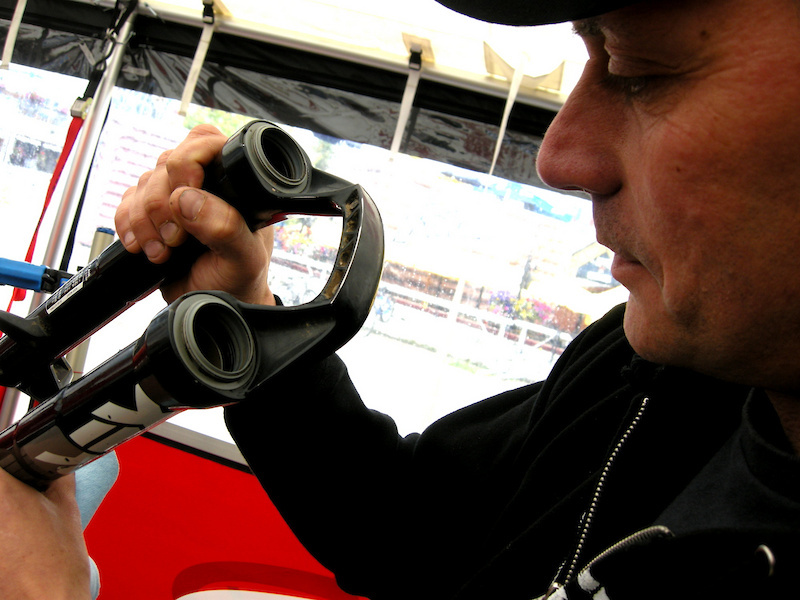 Slip the tire lever under the seal until you can feel the magnesium wall of the slider and pry the dust wiper out. 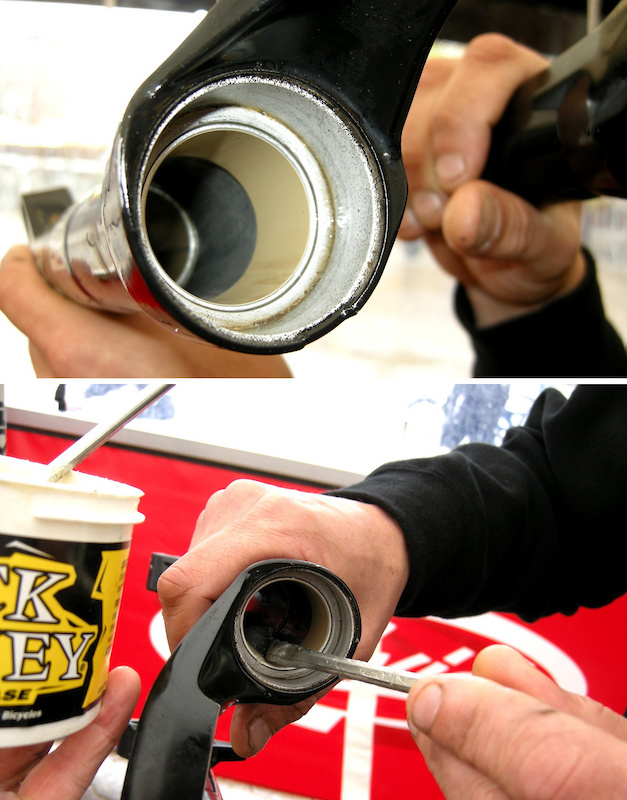 Next, repeat the process with the black oil seal. Be sure to pry on the outer diameter of the seals were they are reinforced with an internal metal band. A large, flat-blade screwdriver will work, but use caution to avoid gouging the sliders. Step seven: Spray the inside of the slider tubes with isopropyl alcohol and then use a lint-free shop towel threaded into a looped wire or a slotted wooden dowel to clean the bushings and internals. Step eight: Reassembly – Shawn uses Pedros Slick Honey grease to lightly coat the upper and lower bushings and then he puts a thin layer on the walls of the slider where the seals will press in. The key here is to use a sparing amount of light, viscous grease. Too much grease will impair the fork’s action and the stuff will seep out of the seals for weeks. Step nine: The seal-lips and numbers face upwards on the fork slider. 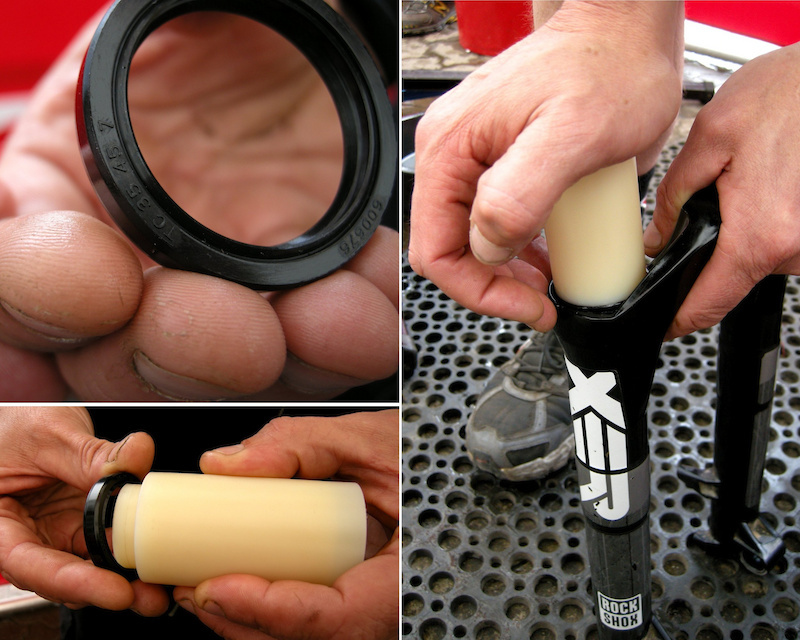 Slide the black oil seal on the 35mm SRAM seal driver and, using firm hand pressure, slide it inside the seal cavity until it bottoms out firmly. Repeat the process with the gray dust wiper seal. Plan B – The optional install method is to find a large (clean) socket with an outside diameter that will just slip into the seal cavity of the sliders. Be sure that the socket contacts the reinforced outer rim of the seal to avoid damage. Place the seal on the slider and then use the socket to press the seal into the cavity. Step ten: Lightly lubricate the seals with lightweight grease and then carefully work the stanchion tubes into the lips of the dust wipers. Slide the stanchions in only about 1.5 inches, so they stop just short of the lower bushings. When you fill the sliders with lubricating oil, this will ensure that you get some fluid between the upper and the lower bushings. 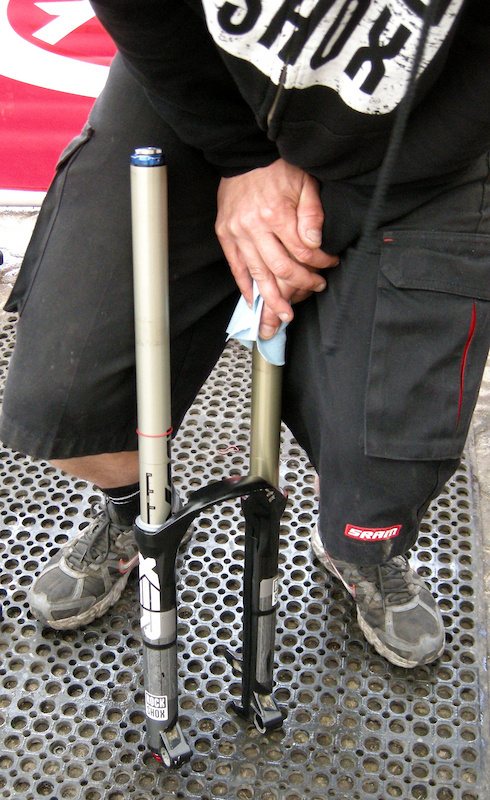 Step eleven: Inject 10 CCs of 15-weight suspension fluid into each fork leg (note: inject 40 CCs into the spring side of a coil-sprung Boxxer fork) and then work the oil around the internals by gently compressing the stanchions into the slider assembly. Step twelve: Clamp the right stanchion tube in the work stand, screw in the rebound drive body and then tighten snugly with a BFC or 24mm wrench (7.3 Newton-meters). Next, install the aluminum crush washer on the foot bolt and tighten it snugly (7.3 Newton-meters) into the left-side slider. Use a fresh crush washer if the original appears jagged edged or damaged. Step thirteen: reassemble the high and low-speed rebound dials making sure that the black washer separates the two. Please don’t over-tighten the 2mm Allen screw. Step fourteen: Put the slider on a padded surface and cycle the stanchion tubes full-travel ten times to ensure that all the parts are sliding perfectly. 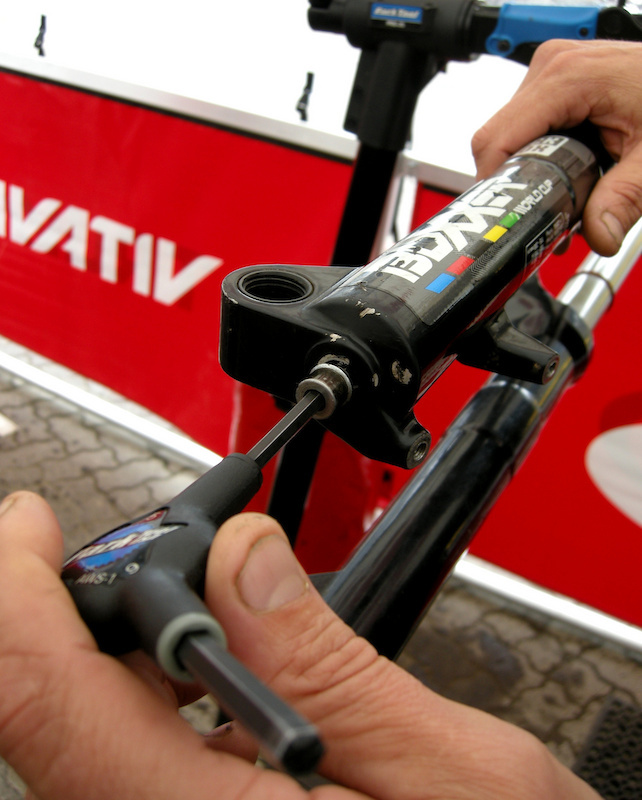 Wipe down the excess lubrication from the stanchion tubes, reassemble your fork, return the rebound dials to your personal settings and then go ride. 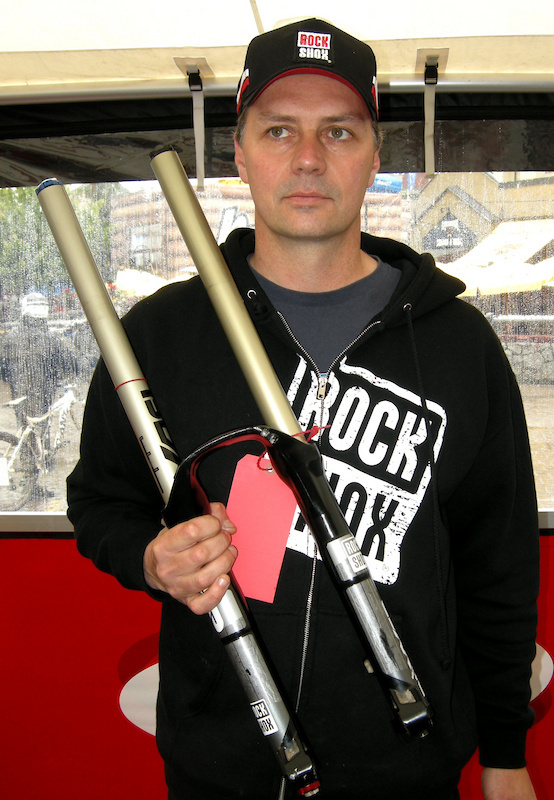 Master of suspension Shawn Cruickshanks poses with Pinkbike's revitalized RockShox Boxxer World Cup fork. Shawn can get through a complete Boxxer fork in about a half hour. 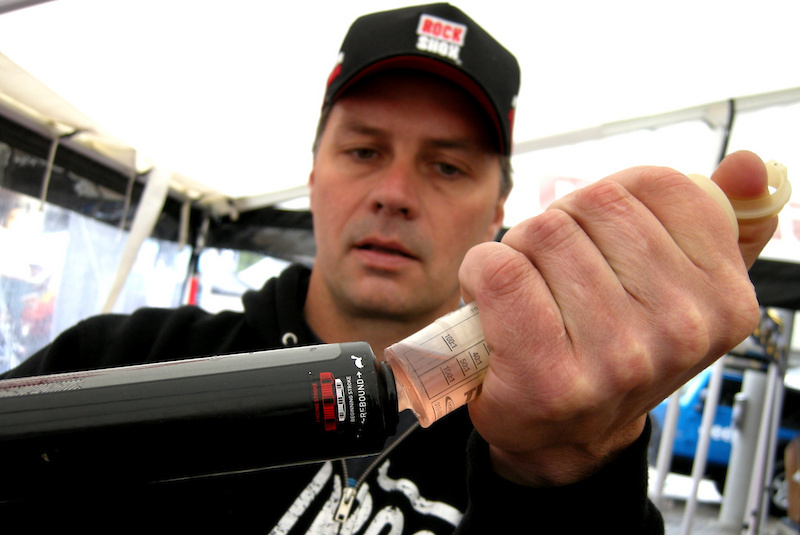 Pinkbike thanks Team RockShox and especially, Shawn Cruickshanks for taking the time from their hectic race schedule to lead us through the Boxxer World Cup fork seal replacement process. If anyone has a tip that may make the process easier, we’d love to hear about it. I like how they spelt pinkbike wrong on the last step. Why no vid? anyway sick tech tuesday would be very helpfull if I needed to replace the seals on my 2011 boxxer that's for sure! @ LeftCoast; Fox 40s are actually even easier to replace the seals on....its bleeding the RC2 damper that is a royal BIATCH on the 40....(at least compared to a Rock Shox damper service). Funny, I did 40s full rebuild like 2-3 weeks ago. Not really hard but you need the proper tool or just cheat your way to bleed the bladder. Yes it is a major pain compared to Boxxers BUUUUT you can basically do a full season without touching the fox cartridge! Now for all the fork repair dudes and dudettes, I'm experimenting different stuffs on the coil side. On the 40s, the grease we put on the spring always ends up mix with the suspension fluid and create some messy goo. I have tried to put 10w then 15w fully synthetic suspension in the lowers with no grease and it works like a charm and the insides are clean. Now, the Dorado service manual gave me an great idea. Toss the suspension fluid altogether from the lower and use fully synthetic motor oil! According to science, the slickosity (opposite of friction) of engine oil is higher than suspension fluid. So on that note, the 40 cartridge is fully sealed so i will still be using the regular 10w suspension fluid in it and use synthetic engine oil in the lowers to keep everything lubed and slick. 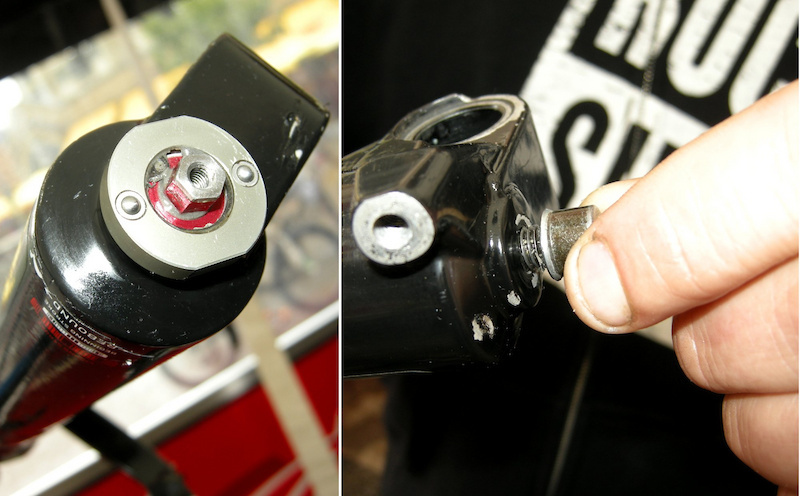 If science is right, the friction on the bushings/seals and stanchions should be greatly reduced! Let me know what you guys think or perhaps if the seals material or anything will get damages by engine oil. Yeah Fox 40s are pretty simple but a video would have definelly helped, and yeah i know thers videos on the web but the all suc cuz they never show a close up of what there actually doing. like the actual fox video is just a guy rebuild 40s from far away lol. well I need to actually see whats goin on. i have some 40s with a bummed RC2 cartridge and a video would help. READ THIS BEFORE YOU DAMAGE YOUR FORK!! One huge problem with this exercise is in step 4. Removing the rebound adjustment body in this way is 100% wrong. If preformed this way you will break your rebound adjustment body. *1st step* after removing rebound adjustment knobs, loosen the adjustment body half way. 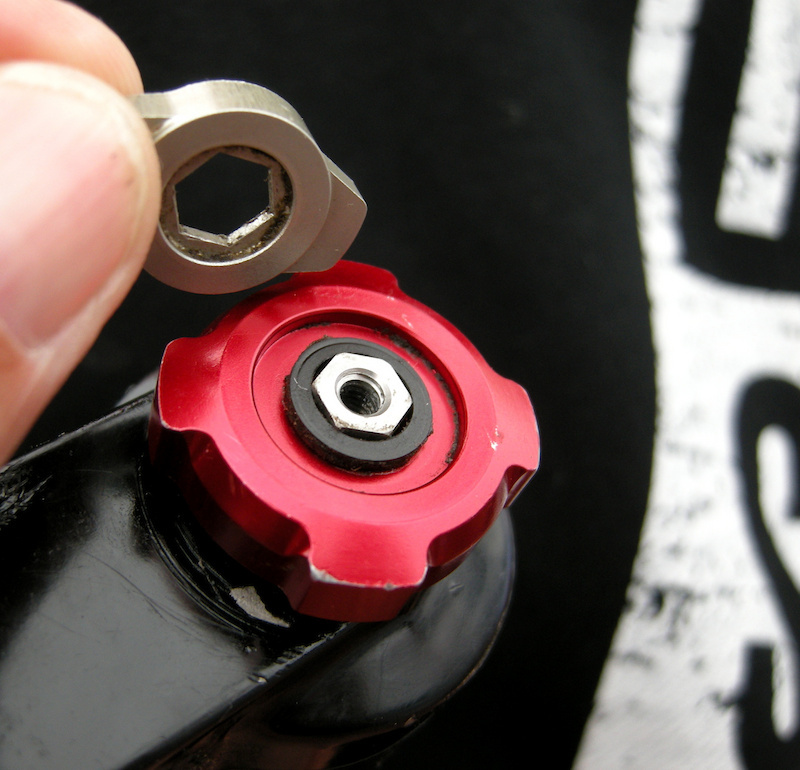 *2nd step* Place a 12 mm socket over the rebound adjuster shaft, against the rebound bolt. Use a plastic mallet to firmly strike the socket to free the rebound shaft from its press-fit to the lower leg. I'm going to second nomis123, video and then step by step pics. The combo is best. guys these tech tuesdays are awesome! would love to see more of them! you guys should make more tech tuesdays on how to replace seals on other forks aswell! really usefull and saves money! Is it the same with Boxxer Race and Teams? pretty much, undo the footnuts remove lowers, the seals come out the same then you put 40ml oil in the spring side and 15ml in the other, not sure if this applys to teams but this is how i do my races. 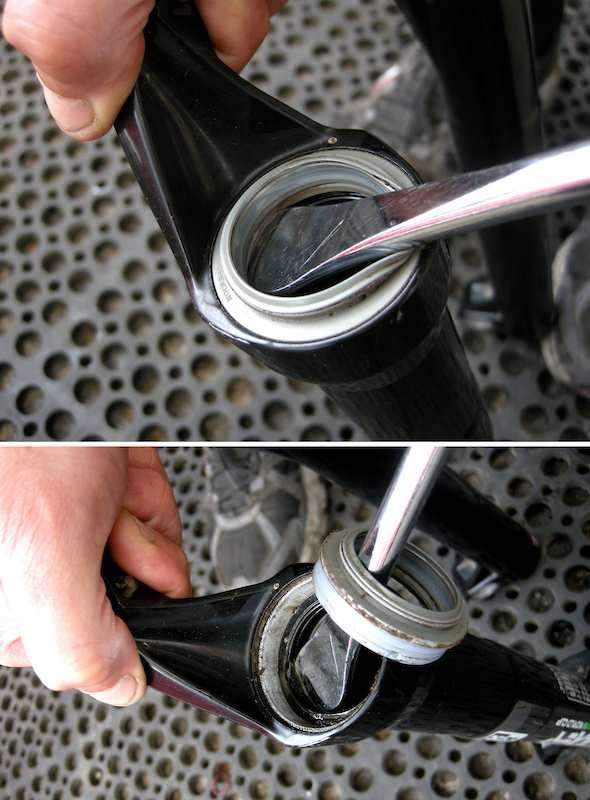 U need to disassemble your fork and repeat the steps shown here! do you have to put new oil in? Well.. when I have to dissasemble the fork for new sels i change the oil! ah something usefull for once, better than showing you how to adjust your saddle height and brake lever adjustment.. Thank for this! I replaced my seals in like 30 min super easy if you follow the directions. 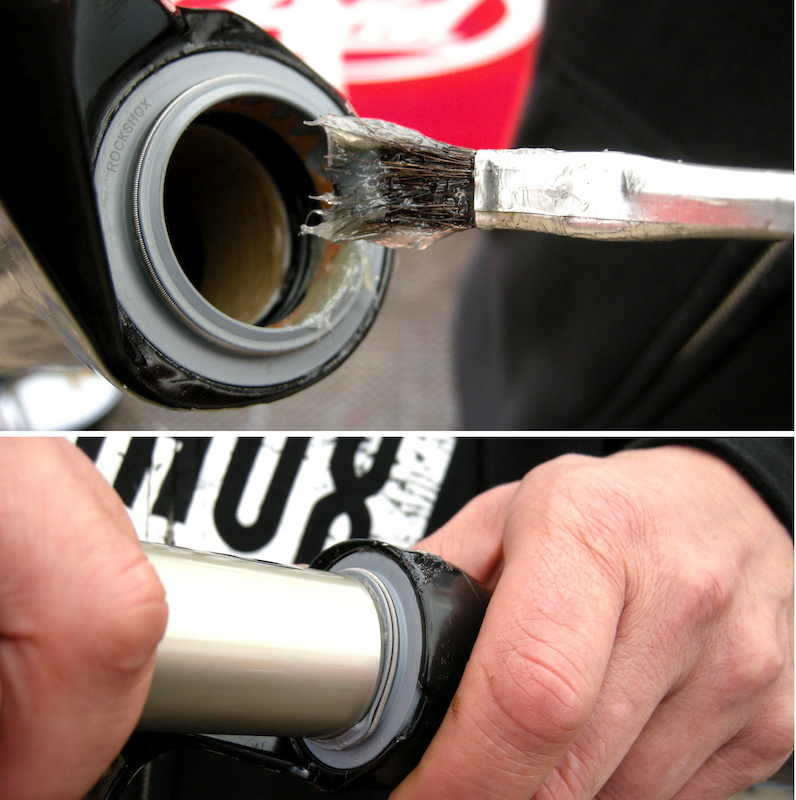 A tip for even smoother running action between bushings and stanchions; mix up the 15 wt fluid with some SRAM Redrum. This should work on all 09' + boxxers correct?? I was thinking the same thing. I have an '09 world cup and was wondering if this process would be similar? something like that just check out sram's website for service manuals! The numbers of the BLACK oil seal have to face upwards in the fork ?? ?